Hakkasan is one of the top fine-dining restaurants that one can find in Dubai. This restaurant is tucked in the in Jumeirah Emirates Towers at Sheikh Zayed Road, where it dishes up authentic Chinese cuisine to its valuable guests. These guests can either dine-in the hall, private area or open terrace of Hakkasan Restaurant, which now also offers brunch. The menu of this venue is a la caret and includes extensive range of wine and cocktails as well to wash down the food. As far as the specialities of Hakkasan Restaurant are concerned, traditional dim sum, crispy duck roll and scallop shumai are at the top. However, guests will also find lot of other delicious and quality Chinese dishes at this eatery, in addition to these specialities. Hakkasan Restaurant offers Chinese cuisine that is quite amazing and also traditional at the same time, as it is prepared under the supervision of experienced chefs. Guests will find various regular and alcoholic drinks in the carte du jour of this eating place along with the food items, which make their eating out experience even better. You can also devour a scrumptious brunch at this eatery, which makes it an ideal venue for those, who usually skip breakfast. Visitors can also consume the luscious food and drinks in the open area seating of this bistro, from where they can also view the hustle and bustle of city. Those, who like to have a private gathering over dinner or lunch at this restaurant can avail the private dining area. However, to avail this facility guests should make an advance booking so they would not face any problem. 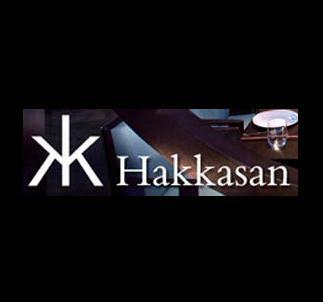 To see the full menu of Hakkasan Restaurant, click here. Hakkasan Restaurant opens on all days of the week. Its operational hours for lunch are from noon till 3:00 pm and dinner is served from 6:00 pm till midnight. Jumeirah Emirates Towers, Sheikh Zayed Road, Dubai, United Arab Emirates. Emirates Towers Metro Station 1 is 450 metres away from the Hakkasan Restaurant in Jumeirah Emirates Towers, which makes it a walking journey of about 5 minutes. All patrons of this metro station need to do is to head in the south course, then turn left before making another left turn that will lead them to the destination, located on the right side. Follow directions. Emirates Tower 1 - Dubai bus stop is 650 metres away from the Hakkasan Restaurant and by walk this distance can be covered in roughly 8 minutes. To do so a bus passenger should head in the southwest direction on 312th Road, from this bus station and then turn slight right. 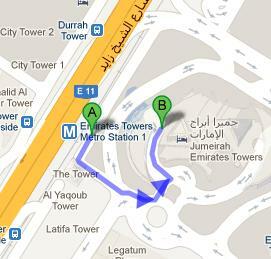 Afterwards at the roundabout take the first exit and turn left to find the destination on the right side. Bus numbers 27 and 29 have stops at this bus station. View Map for directions.